Calendula of the family Asteraceae - This is related to the Marigold plant. Dyes Bright Yellow to Khaki Greens. Use 100% ground flower heads per WOF. Use alum mordant at 15% WOF for protein fibres. Mordant with tannin at 8% WOF and then alum at 15% for cellulose fibres. Cover flowers in hot water and leave it to soak overnight in a warm place. Remove the flowers from the water and dry - these can be stored and used again. 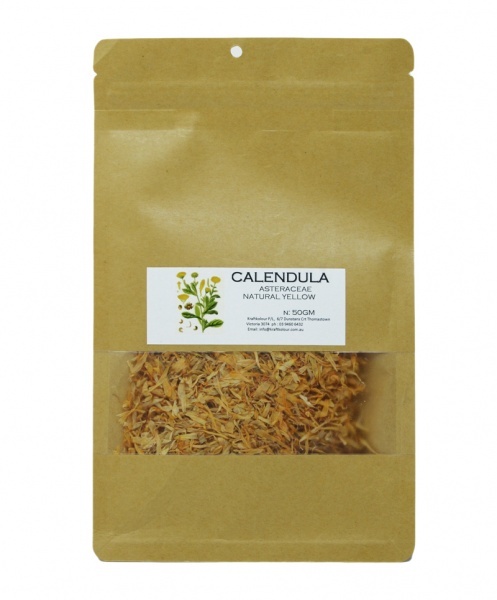 Transfer the Calendula into a dye pot, add fibre and bring to a simmer for 2 hours. Remove the fibre and rinse well. Its normal for some dye to wash out.If you use an iron pot it will alter the colour expected.